So I decided to continue climbing the gravel path through the snow. Since posting my map of Jura mountain cycling climbs, I’ve had two conversations regarding this route above Farges. I told one of my cycling partners Barry that I had climbed it a few years back, but after some discussion with Gilles here, I realized I did not know the top of the route – and it’s not in my Altigraph cycling climb bible. So on a dark, but not too cold day, I decided to investigate. I parked in Chancy, the very Western tip of Switzerland, by the Rhone river so I’d get the complete climb. 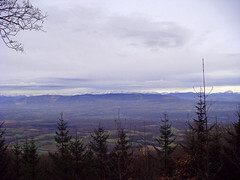 The real climb starts at Farges on yet another beautiful, virtually car-free Jura road to no-where, with ever-improving views of the distant Alps. Yes, it is possible to climb using a road bike, but at about 1,100 metres the road gets pretty poor. And at 1250 metres, to go higher requires a Mountain bike. At about 1,250 meters the paved road ended and I ran into snow. I wasn’t sure where the actual Col was, but decided to explore. 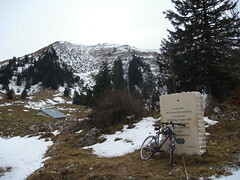 I hate to climb a Col and not find the sign at the top. 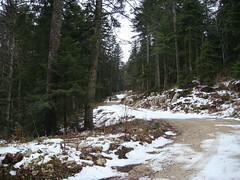 At the parking lot, on the right by a Forest sign, I found a wide, good quality gravel road and continued to climb. There was a fair bit of ice and snow so it was slow going. After a while i realized I could see over the other side of the Juras into the small Menthieres ski-station. A bit further and Voilà, I found a the Col sign (follow the signs for Chalet du Sac). It looks like it is possible to Mountain bike down the other side into Menthieres. 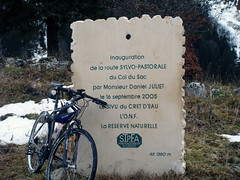 Maybe next year a giant loop returning by the Col de la Faucille or Col du Puthod? Great ride and FREEZING descent. Bravo, magnifique, toujours prêt à grimper! 🙂 Dis-moi, elle fait combien de km cette montée jusqu’à 1380m? Et donc on est obligé de prendre un “hybrid bike” pour “aller chercher le panneau”? depuis Farges, il est environ 11.5 kms jusqu’au col.
From Farges it is about 11.5 kms until the Top. Thanks for visiting my blog. I’m just now checking out yours and I’m feeling rather out of shape reading and checking out the pics. It’s my dream to one day climb the French Alps. I did three century rides in the mountains of North Carolina this year but I’m sure they were nothing like the Alps. I’ll keep checking back and add you to my blogroll. Donald here again. I was reading more and looking through your pictures of climbs you’ve completed in your challenge. I’m wondering do you stick to the same bike… it looks like you have a different frame/model in some pics. Do you change up for weather conditions as well as whatever you feel like riding? Also- do you have a favorite climb? Yes, I change to a hybrid or a VTT (mountain bike) as it gets wetter and colder. All the climbs I have done recently have been with a Hybrid as I have been running into snow and ice. I also have a lot of great trails near me house – so I often do quick VERY hilly short rides from home that are part road, part trails. But all summer I was on a road bike. Favourite? Maybe Col de l’Iseran – South side the day before they opened the road to cars – in June. I had first seen the road under 10 feet of snow while sitting on a ski lift at Val d’Isere and I thought wow that looks special – without realizing how famous it was. Voilà, today I climbed up this lovely quiet col despite there was a lot of snow because of the two last days. Very dangerous descent! And The route to Farges broke my legs 🙂 Now I’m very motivated to discover the other cols in the jura! Felicitations! !, Fantastique. Oui le neige est arrivé. Avez-vous trouvez le stele? Ou trop de neige en haut? Wow well done. yes the snow has arrived. Did you get to the sign or too much snow at the top. There are lots of great climbs in the juras, no need to climb Col de la Faucille or Col de la Givrine ( thus avoiding cars). Oui la descente est vraiement fou. J’ai descendu au pieds aujourd’hui. Yep, descending is crazy. I had to walk for part of my descent today.